UN Records 9 Percent Drop in Afghan Civilian Casualties - Integration Through Media ....! (VOA): The United Nations has documented a nine percent reduction in civilian casualties in Afghanistan in 2017 but warned of increased harm to civilians this year as warring sides are expected to intensify hostilities. The armed conflict last year caused a total of 10,453 civilian casualties, including 3,438 deaths, according to the annual report by the U.N Assistance Mission in Afghanistan, UNAMA, released Thursday. 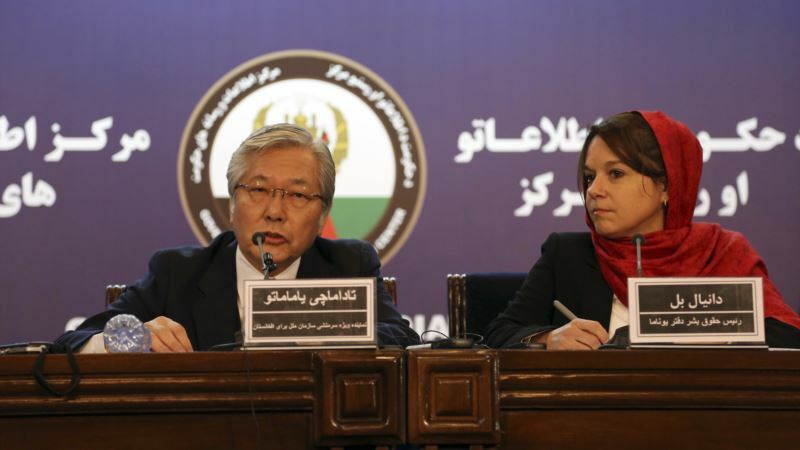 “Each of these figures represents a hope crushed for a better future,” lamented UNAMA chief Tadamichi Yamamoto while addressing a news conference in Kabul. “We are concerned that we will see greater harm this year unless necessary steps are taken by all parties to prevent civilian casualties,” cautioned Tadamichi. In 2016, the conflict-related civilian casualties stood at 11,434, including 3,510 fatalities. Danielle Bell, director of human rights of the United Nations Assistance Mission in Afghanistan, speaking Thursday described the nine percent reduction in civilian casualties last year as an “important step” towards minimizing harm to non-combatant Afghans. “But I must emphasize that 2017 was the fourth consecutive year where the mission recorded more than 10,000 civilian casualties,” Bell told reporters in Kabul. The report noted that suicide attacks together with improvised explosive devices, or IEDs, caused 40 percent of the civilian casualties. Another 33 percent of the casualties have been blamed on ground engagements between Afghan forces and anti-government elements while the rest were caused by targeted killings, explosive remnants of war and airstrikes by government forces and their foreign partners. “The report attributes two-thirds of responsibility for civilian casualties to anti-government elements, mainly Taliban and Daesh (Islamic State). Pro-government forces, which include Afghan National Security Forces, international military forces and pro-government armed groups were responsible for 20 percent of civilian casualties,” Bell said. The rest, she added, were caused mainly by unattributed cross-fire and unattributed explosive remnants of war. Bell said a key finding of the report is that civilian casualties attributed to Afghan forces decreased by 23 percent compared with 2016 due to efforts made to reduce harm during ground engagements with insurgents. But she raised concerns about increasing numbers of casualties in aerial operations conducted by Afghan and international forces. “In 2017, UNAMA documented 631 civilian casualties (295 deaths and 336 wounded) from airstrikes, a seven percent increase from last year, and the highest number recorded by UNAMA (since 2009),” Bell warned. The report acknowledged a 12 percent reduction in civilian casualties caused by the Taliban, though the insurgent group was still held responsible for 45 percent of the overall civilian casualties in 2017. U.S. President Donald Trump under his new Afghan war strategy has instructed military commanders to step up ground and air operations against the Taliban to force them to come to the negotiating table. The insurgents in turn have vowed to retaliate with more force in the coming summer fighting season. The UNAMA chief again emphasized the need for “redoubling” collective efforts to seek a peaceful resolution to the Afghan conflict to bring an end to long running civilian sufferings. “Afghan forces will maintain control of most major population centers with coalition force support, but the intensity and geographic scope of Taliban activities will put those centers under continued strain,” the assessment noted.